What I like the most in IPython is its TAB completion features, it’s not just like normal text matching while you type but it has full realtime introspection, you only see what you have access to, being it a method of an instance or a class or a property, a module, a submodule or whatever you might think of: it even works when you’re importing something or you are typing a path like in open('/home/..... Its TAB completion is so powerful that you can even use shell commands from within the IPython interpreter! Just type “?” after a method of function to print its docstring or its signature in case of SIP bindings. IPython special functions are available for history, paste, run, include and many more topics, they are prefixed with “%” and self-documented in the shell. All that sounds great! 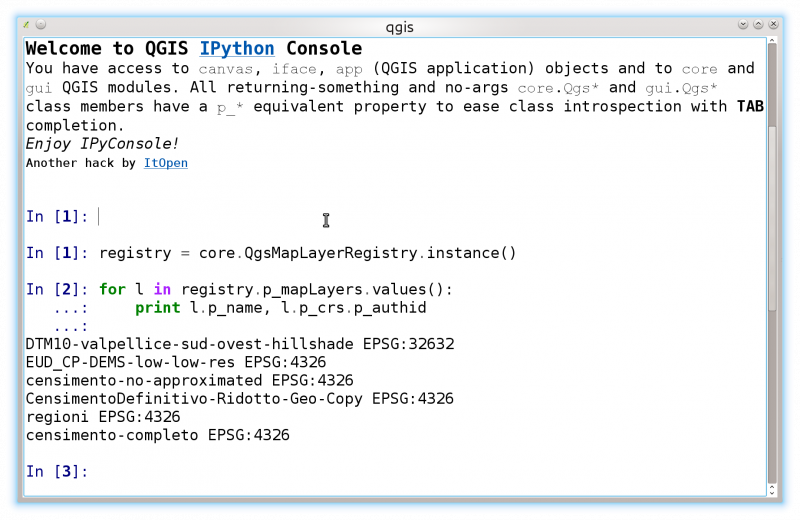 But what has to do with QGIS? TAB completion stop working at the first parenthesis 🙁 What if all those getter would be properties? # With a couple of TABs without having to remember any method or function name! this leaves the original methods untouched (in case they were overloaded!) still allowing full introspection and TAB completion with a pythonic interface. A few methods are still not working with propertize, so far singleton methods like instance() are not passing unit tests. 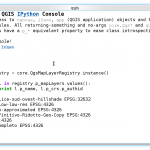 Download IPyConsole Please start exploring QGIS objects and classes and give me some feedback! You basically need only a working IPython installation, IPython is available for all major platforms and distributions, please refer to the official documentation. How can that statement not be offensive? Rather than denigrate work others have done, why not extol the virtues of your work? Sorry, I really didn’t want to offense anyone, I deeply respect the works of other developers, maybe my lack of knowledge of the english language made me write a sentence that was more harsh than I wanted. Thanks for pointing this out, I’ll rewrite it to be more soft. I hope I can use it to debug Python plugins. The installation though qgis 2.10 pisa, python 2.7.5 and ipython 3.1 is corrupted. I can´t make it work, can you state clearly which are the dependencies for your plugin or some installation stuff using pip?. QGIS 2.12.0, it was also working with Pisa and it’s also working in 2.8.3 and in master (I have all the three version installed).